The Worship Group currently meets on Tuesdays at 6:15pm. 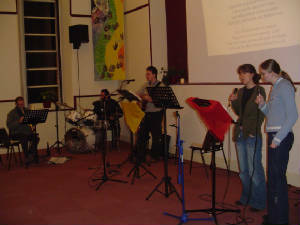 In these meetings, we practice songs for the following Sunday and also new songs that we wish to teach the congregation. These sessions are not only about practising songs, but also about worshipping God with the music that we make. If you are musically gifted and would like to take part in the practices, then come along to find out more.